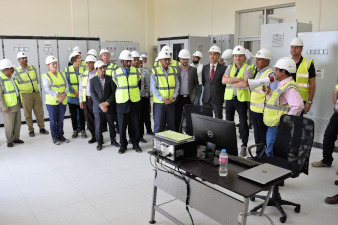 Karachi, Pakistan; November 29, 2018: GE Power’s Grid Solutions business (NYSE: GE) has successfully delivered a turnkey solution to DG Khan Cement Company Limited (DGKCCL), for its new cement plant, one of the largest in the country to date. GE offers a wide range of industry-leading grid solutions across the transmission and distribution industry. GE's F35 GIS is a field-proven solution with high availability that meets the challenges of networks up to 170 kV for power generation, transmission, distribution, tertiary and heavy industry applications. The F35 is a compact and accessible GIS solution, with a bay volume 45 percent below the market average. Moreover, the F35 is environmentally friendly and features an advanced SF6 sealing system. Full digital monitoring, control and protection capabilities together with an optimized user interface enable the F35 to be readily integrated into the smart grid. “GE is proud to partner with DGKCCL to help further enhance their productivity through reduced costs, better managed assets, improved safety, security and reliability across their new manufacturing facility,” added Sarim Sheikh, President & CEO of GE Pakistan, Iran & Afghanistan.